Here are few solutions to customize the pagefile.sys in Windows 10 e.g. size of paging file and virtual memory! 1.) ... Open Settings of the pagefile.sys in Window 10! 2.) ... Set / change the paging file size for windows 10! 3.) ... What should be, when you move the pagefile.sys to another disk on Windows-10! 1. )Open Settings of the pagefile.sys in Window 10! If you want to open the settings for swap (virtual memory) file please start it, via Run-Dialog [Windows+R] and enter the command sysdm.cpl ,3 ! In advanced "System Properties" select the Tab "Advanced" and click the Button "Settings"
In the "Performance Options", please select also the tab "Advanced" and click the Button "Change..."
In "Virtual Memory", please un-check the box "Automatically manage paging file size for all drives"
Please read this: ►... Customize the Virtual Memory! (Image-1) Open the settings of the paging file pagefile.sys in Windows 10! If you receive Windows 10 warnings that your virtual memory is low, you need to increase the minimum size the paging file. Windows 10 sets the initial minimum size of the paging file equal to the size of random access memory installed on your windows plus some extra megabytes , and the maximum bigness equal to three times the amount of RAM installed on your computer. If you see warnings at these recommended levels, then increase the minimum and maximum sizes. 2.) 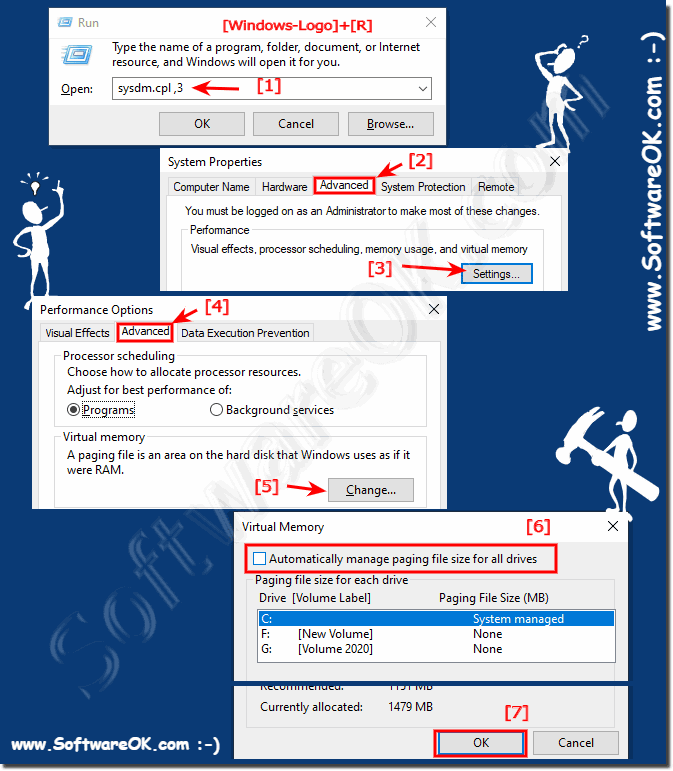 Set / change the paging file size for windows 10 (customize virtual memory)! For example disable, the virtual memory in Windows 10 on C:\ Drive (... see Image-2 Arrow-1&2)! And use custom size for the swap file (pagefile,sys) on E:\ (:SWAP:) (... see Image-2 Arrow-3,4,5,6)! Please dont forget the button "Set" (... see Image-2 Arrow 3 & 7 )! (Image-2) Customize the paging file pagefile.sys for Windows 10! 3.) What should be when you move the pagefile.sys to another disk on Windows-10! When you move the pagefile.sys im Windows-10 to another disk, it should be no external disk! At best, use the fastest hard disk on the operating system! Windows 10 can start without paging file. And the paging file (virtual memory) can be adjusted if necessary again. 4.) Recommended paging file size for windows 10! The old rule "use the double size of the RAM" is for old computers with 1 or 2 GB of RAM. There’s no one-size-fits-all answer to how much page file or swap space you need. It all depends on the programs you use and what they need. If you’re unsure, sticking with your operating system’s defaults is almost always a good idea. this is also for Windows 10 (Redstone 4 & 5), 8.1, 8, 7: Pro, Home, Enterprise, Basic, Premium, Professional, Starter, Ultimate, Windows-Server 2016, 2012, 2008 suitable. Info! This fairly brief FAQ is also suitable for Windows Server 2016 and Windows Web Server 2012 R2 as a smart and easy solution to customize pagefile.sys ergo virtual memory. Windows-10 - FAQ-52: Customize the pagefile.sys in Windows 10 (paging file)?